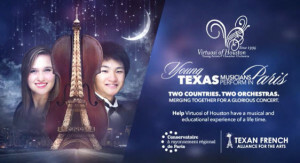 We are proud to partner with Virtuosi of Houston as they prepare to embark on a student exchange with the Conservatoire de Paris, Paris’ prestigious music academy. This one week trip in March will include master classes, educational rehearsals and will culminate in an exchange concert with young performers at the prestigious Conservatoire de Paris. In addition, Virtuosi students will have the opportunity to explore Paris with its rich culture and history. Even if you are unable to attend this unique cultural event, you can make this dream a reality for many of the children for whom a trip to Paris would otherwise not be possible. We need your Help – No amount is too small! Virtuosi’s kickstarter campaign to make this dream trip a reality is well underway but they still need to raise the last third before February 2nd otherwise every penny raised so far will go back to their donors. …Consider making a small tax exempt donation and support this really talented orchestra. You can click on the link below to learn more about the organization and how to make your donation. No amount is too small! Please pass on to friends as Feb 2nd is around the corner.